Forgot to pay for my Budget Direct renewal by the due date and they won't honour the price the following day when I called to make a payment. They quoted me a new a price which is $80 more than before so I gave them up and went looking for a car insurance deal and found that this offer is still active. Wow, this a Rewards Member exclusive offer is not to be missed! Not only could you save up to 10%^ on your Comprehensive Car Insurance policy but you'll also earn 20,000 huge Rewards points! * Just enter your Rewards card number and promo code 20KR when you get a quote online. Offer applies to new policies only, purchased before 11:59pm 28 April 2019 (AEST) and cannot be used in conjunction with any other offer. To receive the offer you must be a Woolworths Rewards member (excludes Tasmanian residents) and enter your Woolworths Rewards card number plus the promo code 20KR at time of purchasing the policy. Woolworths Rewards bonus points will be loaded within 45 days of the first premium being paid in full. Redemption of Woolworths Rewards is subject to the Woolworths Rewards Terms and Conditions available at woolworthsrewards.com.au. Available for a limited time only. Based on comparable Comprehensive cover. Subject to minimum premiums. Savings apply for first year only. Terms, conditions and eligibility criteria apply. Any other available discounts applied before price beat. Please read the full terms and conditions. ^ Up to 10% discount consists of a 5% saving for online applicants, saving in first year only, and up to 5% if drivers under 25 are excluded. Minimum premiums apply and may reduce the saving. so I assume only new insurers? I am with them and have recently received a renewal notice but did a new quote online using all the same details and the other code mentioned below CARX03 and the $100 GC offer appeared under the limited k's option. The T&C's for that are brief and mention nothing about being a new insurer. Just a new policy will do. Should never renew, it's usually more expensive. Can you cancel cover after points are credited? with the $100 wish giftcard bonus promo that maxdax commented below, you'd get the card in the mail like a month or two in. No reason why you couldn't cancel your policy after receiving. Nope, you must continue to buy insurance from them FOREVER! Out of curiosity, how do they monitor your mileage? they don't. you just enter your odometer reading from the start of the policy. you can always top it up down the line (and pay extra of course). they used to have no penalty for monthly payments too but not anymore, so that was a big bonus. If your car's odometer reading at the time of a claim is below the Start odometer reading or above the End odometer reading, you may be subject to the Outside odometer excess of $1,000. Greg, if they need to confirm it the motor registry can tell them as the km on your car is recorded on the inspection certificate. They would only do this if you lodged a claim. For cars older than 5 years they do, yes. All they do is check the odometer when you make a claim. If it's higher or lower than the range you paid for, you pay $1k extra. Use code CARX03 to get a $100GV, by opting for a set number of K's every year, it works I just checked. *Card sent up to 45 days after payment of your first monthly/annual premium. Offer conditional on holding this insurance for a minimum of 30 days and first premium payment received by Woolworths Insurance. Does this only apply to Comprehensive or can i get it for Third Party? I think it works for TP too. A gift card is arguably better as it can be used in multiple stores (including WW) where as the points can only be redeemed at Woolworths. Yes but you can buy whatever gift card you want with points eg eBay, Kogan, Jetstar, even Wish. So more flexibility tbh. Yes but you can buy whatever gift card you want with points eg eBay, Kogan, Jetstar, even Wish. As you can do with a Woolworths git card, so I don't understand how points are better? At least with a physical GC you can at the very least sell it if you don't want it. @CVonC: That's only with Wish GCs, as they can be purchased at a discount. The GC included in this deal is a Woolworths branded card. @Lorindor: Mate, the GC included in the CARX03 promo is a physical WISH GC mailed out to you. I've gotten it 5 times before already, most recently in December. 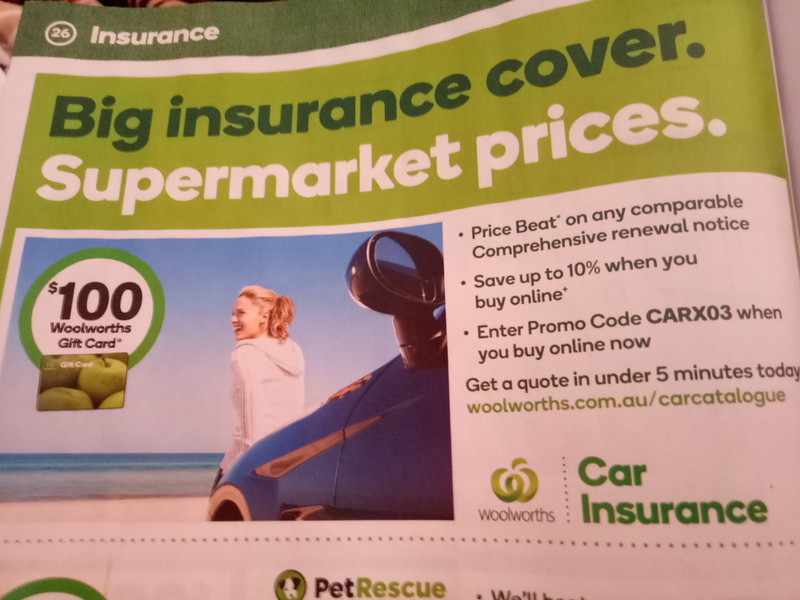 @CVonC: Here's a picture of the promo clearly showing a branded Woolworths GC. @Lorindor: Well then they've changed it since. If purchasing gift cards with a woolies branded gift card still actually works then yes that would be better. Excuse my ignorance but what is $100GV? Grocery Voucher? gift voucher. but it's really a physical wish gift card. Great insurance, just don't make a claim. Really interesting reviews. Sounds like their Insurance arm is being run by a bunch of incompetent (but nice) women. Looks like all car insurers have bad reviews on that site of 2 stars or less, apart from 2 of them. Can second this had a nightmare experience when my partner was involved in a hit in run. They bend over to other larger insurers, so don't expect them to be like the others. Would this code work for drive less pay less option? Twice as much as what I currently pay for my comprehensive policy, I will save my time arguing whether they are willing to price beat it. If it is anything like the Woolworths House and Contents, be wary of the 2nd year increases. Same as most and any Holland backed insurer. It’s my second year with Woolies insurance. I let the first year rego lapse and did a new one also with woolies price beat, no deals but the price was excellent. Can we get 20k bonus points if don't choose "Drive less pay less" as it only show 20,000 rewards points on the option "Drive less pay less". Thanks. Did some quotes for comprehensive motor vehicle insurance recently (Coles, Ww, AP) and Aust Post was easily cheapest. Title says '+ price beat'. How do you get them to price beat when you have to apply online? Just renewed my insurance. I’m currently with Huddle , which is the same insurer. New quote with woolies about the same monthly payment but with $100 in points makes it very cheap (little Nissan). Huddle wanted $33.11 while Woolworths it’s less than $25. Plus I’ll get $100 worth in points. Thanks Op! I asked a smash repair shop owner once who was the best insurer… he said none, they are all a PITA. That means we should always go for the cheapest? I signed up with Aami a few days ago. Woolies is $2 more expensive per month and they wont price beat. I called them and their attitude was appalling. Even with the GC or Points, not worth it. If that is how they treat new customers can you imagine how they would be with existing?! Yes, after paying and I noticed that my card will be saved and used for renewal. I wanted my card details removed and not be used for renewal so I called up to try and stop the automatic renewal. When I called up the girl explained to me that they will send out a renewal notice 30 days before the due day and I have the opportunity not to renew. There was no way for her to remove my card. I also felt there was lack of manners and felt their attitude was appalling over the phone. It was an Australian call center and they need training ASAP. Their attitude was shocking. I just hung up on them. If you forget, do a charge back. Record the conversation when you call to say they don't have permission to auto renewal the policy next year… Or just cancel the policy, and site this at the reason. Thanks, was due to renew with Coles soon, and this was cheaper already. Thanks, just took the offer as my current insurance is expiring soon! I just got Woolworths insurance to price match Officeworks insurance that's on clearance. Got an insane price. insured my car with them year ago using price beat and $100 gift card, it was ~$650 - $100GC = $550, sweet. This year they sent me renewal notice, $1150. Tried to negotiate on the phone, they put me on the hold for ~30 mins so I decided that it does not worth those $20-$30 that they will price beat another insurer (if they price beat at all) and I hung up - anyways CC that I've paid year ago is blocked for a few months. Looks like I don't understand how credit cards (or probably direct debits) work - a week later I've got $1150 charged on the blocked CC. So spent another half an hour cancelling that renewal. Mine's gone up $100 this year but I'm unable to beat their renewal quote anywhere else, once I take into account 20 days car hire, excess free windscreen replacement, the specified car value and $600 excess. I have had plenty come in cheaper on the basic quote but not once I add in the above. Their own quote (as if I was a new customer) is $200 more than my renewal too. Seems attractive but not if they are as bad as people say. I got a new car and checked every site for a quote because I had a claim 2 years ago and when I divulge it, most insurers jack up the price. Ended up with CommInsure, only one who didn't price jack when I mentioned the claim. When the first offer is so high i dunno if i want to leave Bingle. A comparison on iselect at others starting at $1100. 1. Does the NCD get affected? 2. Do you have to pay the excess? I know some insurance companies dont ask you to pay excess. 3. In windscreen field it says null fee, but also states it in the optional field?, so am confused if its free repairs for windscreen or what? 4. In case of wrong oddo, i am assuming excess of $1000 is above the base excess? 4.If you provided incorrect/dishonest info it may void your insurance altogether. Ask Woolies to clarify your question.
" Many people, including myself, in that thread are having significant difficulties in getting Woolworths Insurance to pay out the 20,000 bonus points. That is, Woolworths Insurance has breached the terms of their offer. You should be aware of this and prepared to fight for the points should you take up this current offer." My 20K 'points' weren't actually credited as points, but as $100 of WW dollars. I only noticed when i logged into my every day rewards account. I normally track my points via the Google Pay app as my card is loaded on that app and the points weren't appearing.